Beautifully hand crafted Steven Khalil dress. 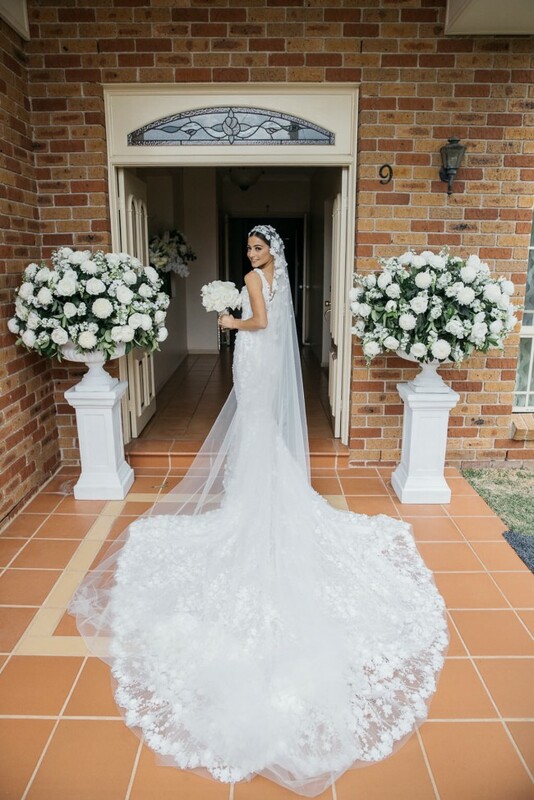 This dress is made using 3D scattered lace and beads with additional 3D florals hand sewn throughout the dress to complete the look. I am 165cms tall and wore 10cms heels. The dress includes a structured coresette to add extra definition. This corsette can be removed by a tailor to allow for extra room. With the coresette attached it fits a small size 6, with a bust size 32A. Dress is quite light and was so comfortable to wear for the entirety of the day. The train is 3 metres long from the waist and can be pinned up. Veil included with purchase. Dress has been professionally dry cleaned and is in perfect condition. It is currently packed away in a box with acid free paper to prevent discolouring.